Over 20 days uncover the best of Scandinavia with a voyage across the Arctic Circle to the Svalbard Archipelago. Visit Copenhagen, Bergen, Stockholm & Oslo. With lush forests and fjords, crisp air, charming architecture and an undeniably fashionable edge, the Scandinavian cities have much in common. Copenhagen’s brightly coloured foreshore reveals its humble origins as a fishing port, its charming cobblestone streets contrasting with Stockholm’s elegant 57 bridges linking the 14 islands that make up the city. While cosy Oslo is nestled amongst the Nordic forests, lakes and green hills of your imaginations. Welcome to Oslo where your wondrous journey begins with a two night stay. Discover the amazing history of the Vikings as you visit the museums honouring the rich nautical heritage of the Norse race and its warrior ancestors. Explore the Viking Ship Museum, the Kon-Tiki Museum and the Fram Polar Ship, the strongest wooden ship ever built. Step on board to see how the crew survived in the polar regions. Tonight enjoy a memorable dinner. Fly to the trendy Swedish capital. Said to be one of the most beautiful capital cities in the world, Stockholm is built on 14 islands connected by 57 bridges and looks proudly onto the Baltic Sea. The architecture, lush greenery, fresh air and proximity to the water are distinctive traits of this city. Spend the next two nights in Stockholm. With your expert local guide discover City Hall and its spire featuring the golden Three Crowns, the Riddarholm Church and the Royal Palace. Visit the Vasa Ship Museum, where the 17th century warship is housed after it tragically capsized and sank on its inaugural voyage in 1628. Fly to Copenhagen for your two night stay. From its humble origins as a fishing village to its heyday as the glittering capital of the Danish Empire and now one of the world’s premier design capitals, the stories and characters of Copenhagen’s history are found in its palaces, copper-roofed town houses and cobbled squares. Take a cruise and see Christiansborg Palace, the Black Diamond Library and the Little Mermaid. Alternatively, visit Tivoli Gardens. Delight in your farewell dinner in one of Copenhagen’s finest restaurants. Bid a fond farewell to Copenhagen and board Scenic Eclipse. Meet the Captain, crew and your Discovery Team this evening. The capital of southern Norway, Kristiansand boasts a picturesque Old Town, home to traditional wooden houses and a neo-gothic cathedral. Explore the distinctive Christiansholm Fortress built by royal decree in 1662 or walk through 50 hectare park at Gimle Estate to discover Agder Natural History Museum and Botanic Gardens. Take a Scenic Discovery bicycle excursion through the Baneheia and Ravnedalen Nature Park. Norway’s magnificent second city is set on a beautiful convergence of fjords. Freechoice: Discover the city’s fascinating quarters, walk across the Bryggen old timber wharf or ride the funicular to Floibanen for stunning views. You may choose to visit the interesting Fantoft Stave Church. Take a Scenic Discovery hiking excursion or a guided bicycle tour. The largest fjord in Norway, at its deepest Sognefjord plunges to more than 1,300 metres while the mountains straddling it rise to more than 1,700 metres. Discover the village of Flåm in the heart of the fjord. Ride the world-famous Flåm Railway for a day of stunning scenery. You may choose to explore an authentic Viking Village or see the white caves of Gudvangen. Choose a Scenic Discovery kayak excursion, a bicycle ride or a hiking tour. A day of stunning scenery awaits cruising the World Heritage-listed Geiranger Fjord, unspoilt and rare in its pristine beauty. Explore this 20 kilometre emerald-green wonder up close and discover the Seven Sisters, The Suitor, and The Bridal Veil falls. Explore the small town of Geiranger and visit the Dalsnibba view point for stunning panoramic views. Straddling several islands, Ålesund houses a unique concentration of Art Nouveau architecture set amidst stunning scenery. Discover the secrets of this small community on a walking tour this evening. Relax on board and take advantage of the expansive array of facilities and dining experiences. Great, craggy islands that touch the sky, picturesque villages and abundant wildlife make the Lofoten Islands a must-see destination. Discover the unexplored coves and bays of this stunning wonderland and marvel as the Captain and crew navigate the narrow mouths and steep ravines of the fjords. Visit the small community of Gravdal on the island of Vestvågøya. Explore the pretty town of Henningsvaer or visit Svolvaer and the Magic Ice Bar. 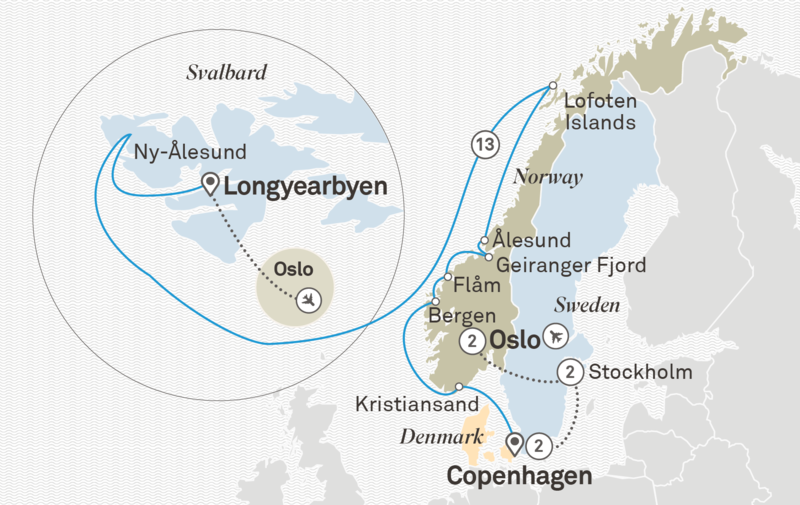 Cruise the Norwegian Sea across to the Svalbard Archipelago . The Svalbard Archipelago’s rugged glaciers and frozen tundras are a fragile and remote area of vast environmental significance, while Spitsbergen is the largest island. Due to the extraordinary nature of the region, the sailing and expedition schedule is flexible. Your experienced Captain and Discovery Leader will use their expertise to design your voyage from day to day, making the most of the long hours of daylight, weather and ice conditions. You will partake in daily Scenic Discovery excursions by Zodiac, kayak and on nature walks. Discover majestic Arctic scenery, tundra landscapes, the wildlife and marine life, taking you to the place of your wildest dreams. Continue exploring the Svalbard Archipelago. Day 18 - Svalbard Archipelago. Day 19 - Svalbard Archipelago. Your cruise ends this morning as you say farewell to the crew, disembark and fly to Oslo. Discover the Scandinavian Highlights on this 7 day tour from Copenhagen to Oslo. See Christiansborg Palace and the Little Mermaid sculpture in Copenhagen.